“The campaign applied for and obtained a permit from the California Film Commission to film at the courthouse by going through the same legal process that is available to everyone," a lawyer for Becerra said in a statement. Becerra's team called the Jones lawsuit "baseless and frivolous." 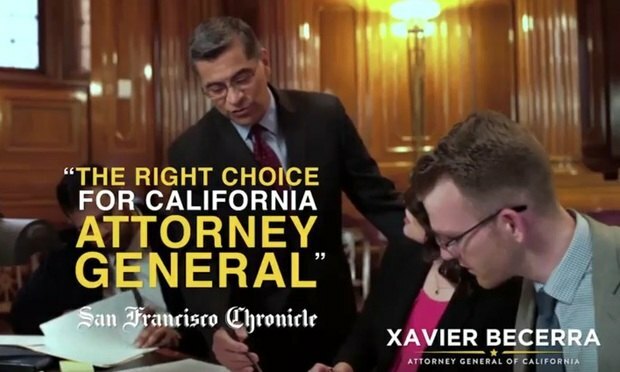 A screencap from a new Xavier Becerra campaign ad. Xavier Becerra’s Democratic rival for attorney general, Dave Jones, on Thursday broadened his attack, alleging in a new suit that the incumbent misused a working courtroom in Sacramento as a campaign ad backdrop. Despite its critical significance, many of the Music Modernization Act’s most consequential procedural rules and implementation details are yet to be determined and developed. Santa Clara University law professor Eric Goldman discusses how emojis are complicating litigation.